In mathematics, it can be useful limit the solution or even have multiple solutions for an inequality. For this we use compound inequalities, inequalities with multiple inequality signs. When solving compound inequalities, we use some of the same methods used in solving multi-step inequalities. The solutions to compound inequalities can be graphed on a number line, and can be expressed as intervals. One of the difficult things about inequalities is that sometimes it is like two problems on top of each other, that's what is called a "Compound Inequality." 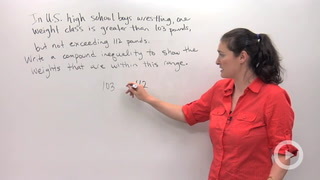 Two inequalities combined into one statement using the word "and" or "or" is called a compound inequality. And here is a couple of examples, this is like one problem it looks like two problems, this is one problem right here, x is greater than 2 and x is less than 5. Sometimes you'd see it like this, you'll have x in the middle, there is the x is less than 5 piece and I'm, going to combine it with x is greater than 2. It's kind of tricky this is the same thing written in two different ways, here it uses the word and, here it just has the two different inequalities signs. And when you graph an and problem your graph is going to look like a dumbbell. You're going to have two values and you're going to be marking the area in between them. Or, this is another kind of compound inequality that uses the word or, x is less than 3 or x is greater than 8. It's kind of weird this is just one problem even though it looks like two separate things we graph them together. Like I would have x is less than 3, 0 1 2 3. x is less than 3 or x is bigger than 8, 4 5 6 7 8. x is bigger than 8. This graph is kind of dumbbell shape represents an or compound inequality. And the trick is that you might have and where it looks like a dumbbell or you might have or where it looks like it's going out like I remember it cause it looks like oars like if you were in a boat oars I don't know if that helps you. But these are the two different types of compound inequalities, one more thing that I want to leave you with is that if you're asked to solve something like this like if it had been x+1 right there you would pretend like there were just two different equal signs. Like if that was x+1 I want to subtract 1, I would subtract 1 here, subtract 1 there and subtract 1 there, so it would look like 1 is less than x is less than 4. That's a whole another problem and you'll see them more when you get into some solving just keep in mind compound inequalities is like two different problems combined into one if it uses the word and it'll look like a dumbbell, if it uses the word or it'll look like oars like rowing oars.